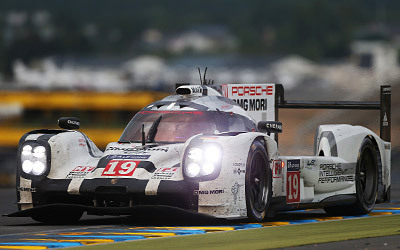 Porsche has taken victory at the Le Mans 24 hours race with the #19 car driven across the finish line by current Formula One driver Nico Hulkenberg. He was joint driving the car with Earl Bamber and Nick Tandy. Having upped their pace through the night, Porsche also settled its #17 car into second place, the red painted Porsche steered by Hartley, Webber and Bernhard. The first Audi across the finish line was last year's winning trio, the #7 driven by Lotterer, Tréluyer and Fässler. Next up were Audi's #8 and the third, black Porsche with #18. Toyota's LMP1 cars this year proved extremely reliable, but the Cologne based team failed to make the performance step its competitors made over the winter. The TS040 Hybrids finished in 6th and 8th positions, sandwishing the third Audi R18 e-tron quattro. In LMP2, KCMG dominated the race after easily qualifying for pole earlier this week. Bradley, Howson and Lapierre were 9th overall but just 48 seconds ahead of the #38 Gibson 015S - Nissan from JOTA sport. Completing the podium for LMP2 was G-Driver Racing with the #26 Ligier JS P2 - Nissan. Among the GT's, the #64 Corvette C7R proved fastest in LM GTE Pro while in the amateur category, the race was won by SMP Racing with a Ferrari 458 Italia.